Below is a summary of how our endorsed candidates and positions performed. The Travis County Republican Party will gather Tuesday evening in anticipation of victories up and down the ballot and in celebration of record GOP turnout in Austin. Select candidates and Travis GOP staff will be on-hand for media interviews and analysis of the incoming numbers. Local election results as well as key state and national races will be tracked throughout the evening and electronically displayed. All are welcome. For any specific accommodations please contact Andy Hogue, Communications Director, at (512) 298-9996 or communications@travisgop.com. While the Travis GOP does not offer vote recommendations on all local ballot items (see all local ballot items here), we do consider resolutions from our Resolutions Committee (and approved by our Executive Committee) that support or oppose certain options. *City of Austin propositions H through I are procedural in nature and we recommend they be supported. Our most urgent needs at the moment (10/15/18) are listed above. Can you help? Having Republican workers present at polling locations across Travis County helps assure fair and impartial elections. Can you spare some time to help with this vital function of what we do as Travis County Republicans? Those interested should contact Carla at Carla.tcrp@gmail.com ASAP. The pay is $10/hour. Judges and Alternates selected must attend a four-hour training at 5501 Airport Blvd. the week of Oct. 22. 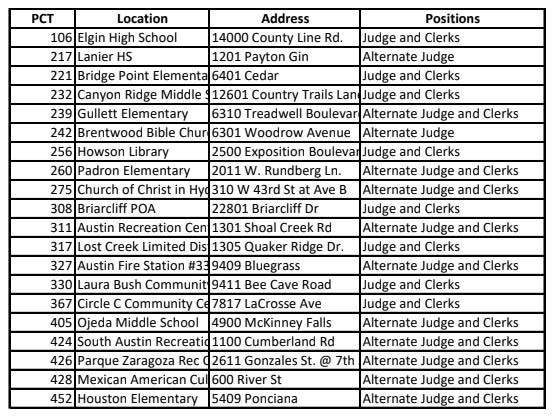 Workers must be registered to vote in Travis County but may work at any precinct (in other words, not just your home precinct). High school students age 16 or older may work as Clerks. Thank you for making election year 2018 a success! Wanted: yard space for campaign signs! UPDATE: Thank you for your interest. 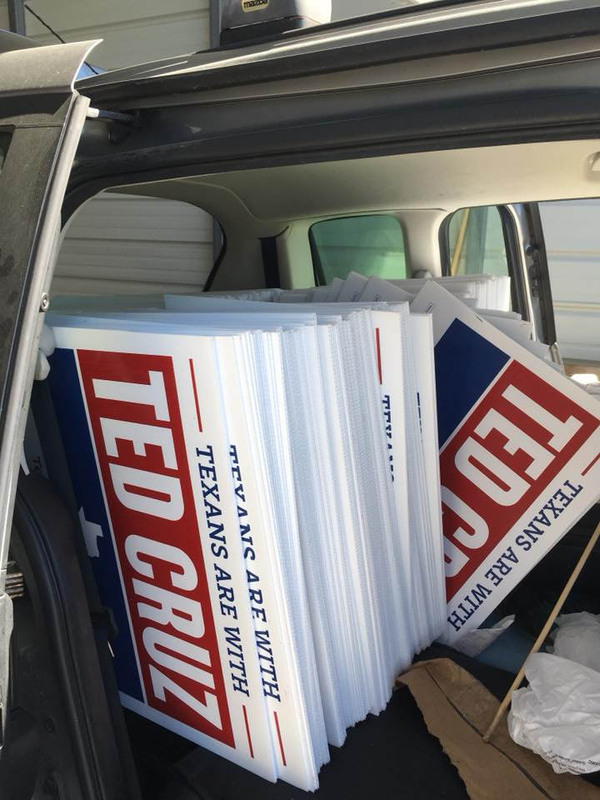 We are no longer delivering yard signs. We have a limited supply of certain candidates' signs, stickers, and brochures at headquarters: call (512)302-1776 to arrange a time to visit.